On 28 November, 2017, the COAR published the report "Behaviours and Technical Recommendations of the COAR Next Generation Repositories". The report presents the results of the work of this group, including recommendations for the adoption of new technologies, standards, and protocols that will help repositories become more integrated into the web environment and enable them to play a larger role in the scholarly communication ecosystem. 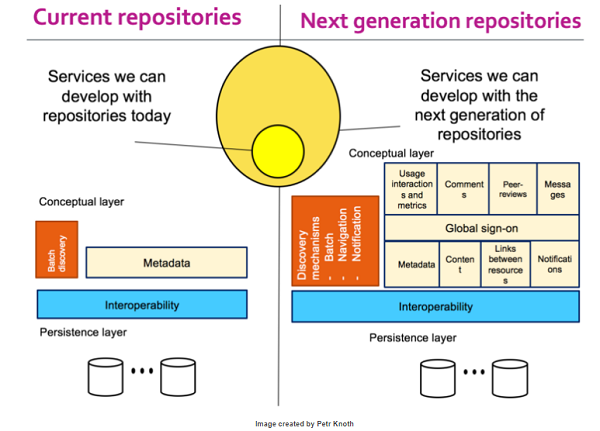 One of COAR’s major objectives for 2016-17 was to identify the core functionalities and behaviours for the next generation of repositories, as well as the architectures and technologies required to implement them; and to work with the repository community to help adopt these functionalities. The report "Behaviours and Technical Recomendations of the COAR Next Generation Repositories Working Group" describes 11 new behaviours, as well as the technologies, standards and protocols that will facilitate the development of new services on top of the collective network, including social networking, peer review, notifications, and usage assessment. COAR very much hopes that the recommendations provided in this report will contribute to the transition towards next generation repositories and libraries. HOW SHOULD REPOSITORIES BE POSITIONED IN THE FUTURE ? needs to be supported by a wider array of roles and functionalities, which can be enabled through new levels of web-centric interoperability. COAR believes that the globally distributed network of more than 3000 repositories can be leveraged to create a more sustainable and innovative system for sharing and building on the results of research. Collectively, repositories can provide a comprehensive view of the research of the whole world, while also enabling each scholar and institution to participate in the global network of scientific and scholarly enquiry. Building additional services such as standardized usage metrics, peer review and social networking on top of a trusted global network of repositories has the potential to offer a viable alternative. COAR’s mission is to ensure that, as libraries and research organizations invest in and enhance their local services, adopt common standards and functionalities that will allow them to participate in the global network. The COAR Next Generation Repositories Working Group was launched in April 2016, to identify new functionalities and technologies for repositories. The work of this group is based on a set of principles and design assumptions. COAR Next Generation Repositories user stories.